Few things are more important when it comes to designing a bathroom than lighting. 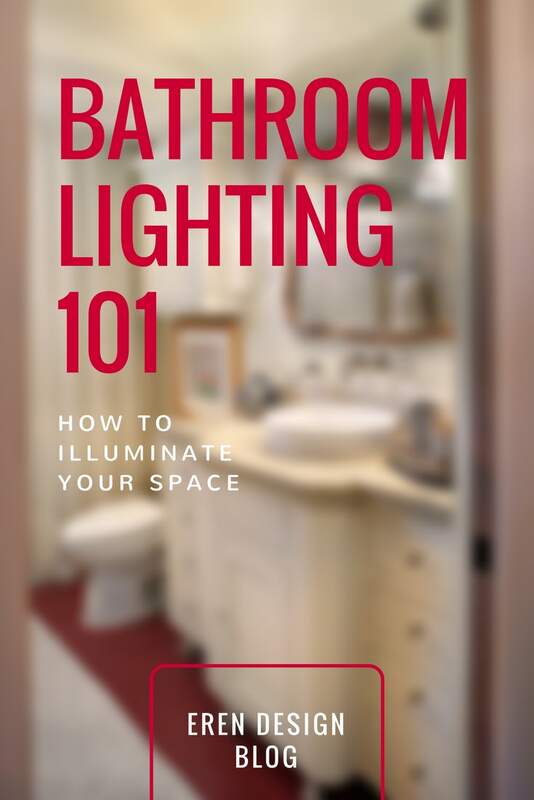 No matter the size of your bathroom, proper lighting drastically improves your space. It can be the difference between having a cave within your home and a space you enjoy spending time. Even tiny bathrooms benefit from good lighting. And, in large bathrooms, proper lighting can help ensure your space maintains its spa-like feel. Why is this important? Because while bathrooms fulfill a very utilitarian purpose, they can also be your own personal sanctuary – a retreat that’s all your own. Use the following lighting tips to create the best lighting design for your bathroom. It may seem counterintuitive to place a light directly towards your face. Most of us don’t like looking directly into the sun or at a light bulb. It hurts our eyes. Bathroom lighting is different. We’re not talking about an ultra-bright light that will blind you. Nowhere in your house do you need a light that bright. Rather, we’re talking about a softer light that comes directly towards you. This placement is important because it limits harsh shadows that can make it difficult to see. Think of a light placed overhead or directly beneath your face. The shadows create a moody effect that can be wonderful for telling ghost stories. However, those shadows aren’t so great when it comes to applying makeup and shaving. While we just discussed the downfalls of overhead lighting, the issue isn’t precisely that overhead lighting is bad. It’s that you don’t want to exclusively use overhead lighting. By using different light sources to layer your light, you can effectively illuminate your space with a soft glow. This helps keep funky shadows at bay. It’s more flattering to your appearance. And, it brings a true warmth to your space. Like paint and skin tones, light comes in a wide range of colors. These colors can have a significant impact on the mood of your bathroom. Color ranges within light aren’t just manmade. You can see them in nature. Think about a foggy day when the light is heavy with grays and blues. Compare that color scheme to warm, summer afternoon when the light is heavy with yellows and golds. The different colors can often evoke different emotional responses. Grays and blues have a tendency to make us feel depressed and sluggish. Conversely, warmer tones are often comforting and uplifting. You want to use these tones to your advantage by using light bulbs with warmer tones. When looking at bulbs, consider the color rendering index (CRI). The CRI indicates how much grey is in the light’s tone. The lower the number, the more grey that is present. Often a bulb with a CRI of 80 or higher is ideal. Mother Nature doesn’t always deliver the exact light tone we want. Nor does she always provide enough light, especially at night. Yet in general, natural light is the best light available. Scientists at the Lighting Research Center in Troy, N.Y.,reported that daylight increases productivity, provides mental and visual stimulation, and improves the comfort of inhabitants. When possible, incorporate natural light sources into your bathroom. Windows offer a lovely focal point for any space. However, they aren’t a luxury all bathrooms have. Additionally, windows can present a privacy issue depending on where they are placed. Skylights are often one of our favorite bathroom lighting solutions. These overhead light sources can be used to fill your space with natural light during the day. Most of us know about vanity lights and overhead lights. These are only the tip of the lightbulb, so to speak. Depending on your needs, you may benefit from an additional type of light fixture. The following types of bathroom lighting can be incorporated into your space to deliver more light and beauty. Toekick lighting is installed underneath the base of your cabinets. It provides a soft glow that illuminates the floor, effectively creating a lit footpath. This is ideal at night when you’re trying to navigate your way to use the facilities without turning on a bright light. Accent lighting is used to add depth to a space. Typically used to highlight artwork, accent lighting often acts like a spotlight. In the bathroom, it can help brighten a corner or a specific work zone. This allows you to control focal points within your bathroom, so you can visually expand your space. A pendant light is an overhead light fixture suspended from the ceiling. They are typically suspended by a cord, chain or metal rod. One of the beauties of pendant lights is the ability to incorporate a lowered light source without taking any space from the floor or the wall. Often pendant lights are used in sets of two or three. However, you may want to use a single pendant light in a corner. Chandeliers are often associated with formal dining rooms and grand entryways. However, they can also dress up your bathroom. As a ceiling fixture, chandeliers bring a bit of intrigue to your space while also offering a warm glow. They can be placed near tall mirror to help draw the eye up. Chandeliers also look lovely placed over a large soaking tub or near the entry. Wall sconces are another way to illuminate your space. They can be added in sublet, nearly imperceptible ways. In cases such as this, they blend into your bathroom’s walls without intruding on your space. Alternatively, you could use wall sconces as decorative lighting. This allows them to do double duty, bringing both light and beauty. The ideal wall sconce directs light up and out, providing ambient lighting that helps fill the space. Lamps are not commonly seen in bathrooms. However, they can offer a warm glow to a vanity tabletop or corner nook. If you choose to use a lamp, select a lamp with a neutral colored shade. This helps keep the light tone from being distorted. Is your bathroom in need of new lighting? Schedule your update for this summer while you’re out of town. This allows you to recreate your space while you’re gone so you can enjoy it next fall when you come back! Should You Install Dual Sinks in the Master Bath? Dual sinks in the master bath give you the personal space to spit and brush at your own leisure so that you can your partner never have to knock elbows again. From the paint on the walls to the lotion our contractors wore, we used hypoallergenic bathroom remodeling techniques to make sure the finished product was as safe as it was beautiful for our client. Barrier-free showers offer a beautiful design you’ll love, in a functional format you’ll be able to enjoy for years to come.